Framing is the process of building the foundation of a structure like a house or a building. Think of the frame as the skeleton of your house. It is the main structure that holds your house and garage together, the framework that holds the whole building together. In many cases, carpenters carry two hammers with them, and you can be sure that one of them is a framing hammer. That being said, you must follow a professional to guide you on how to use a framing hammer. You can also learn everything that you need to know on your own to use framing hammers correctly. The good news is that you can improve as you go along. What is a Framing Hammer? Stanley’s FatMax Steel Anti-Vibe Hammer gives you a strike face that is 75% larger than any traditional hammer you can find. This larger strike face gives greater accuracy for your carpentry work. 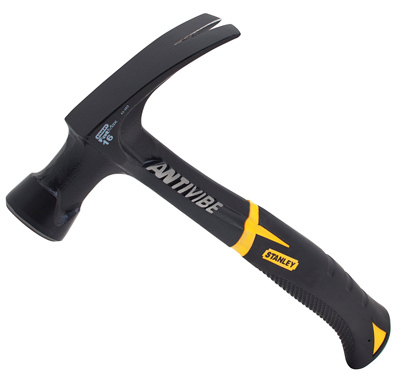 The Anti-Vibe hammer technology greatly reduces the vibration every time you hit a nail. This also minimizes the amount of shock you receive on impact. This hammer comes with torsion control stabilizers. That means you can go pounding for hours and you won’t feel much fatigue on your arms. This technology makes it a point that whichever direction you twist your arm while pounding, you can be sure it is protected. Another added feature of this hammer is its rim temper so you won’t see it chip away or spall even if you use it everyday for a month or two. 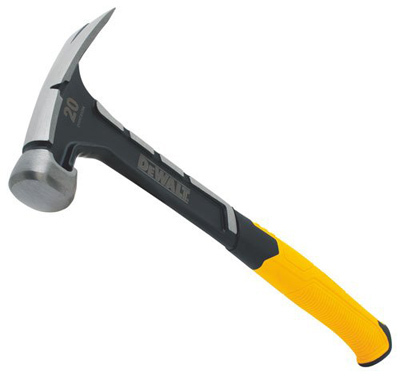 The hammer’s one-piece steel construction defines its durability and strength. Overall, the hammer is built with superior balance and precision. This means that even if you are a beginner when it comes to handling hammers, you can be it is not going to slip off your hand as long as you aim it right. The Stanley Extreme framing hammer is perfect for normal framing works and will definitely finish work sooner because it has a strike face that is 75% wider than usual. However, it may have some issues with having no magnetic nail starter. This framing hammer comes with a traditional hickory handle. This high-quality handle is built to last for a long time. This framing hammer is designed for a better and more comfortable grip. Another thing you will like about this hammer is its durability because of its forged and heat-treated head. It also has the same rim temper that minimizes spalling or chipping away even after months of use. This hammer’s head has a flare design so it does not only let you strike the surface better but it also drives the nail more easily. In fact, its magnetic nail starter allows for a one-handed nail setting. This hammer has a long handle that is built for extended reach. This is useful if you want to use this small hammer to reach small spaces that are partly enclosed. Customers are happy w because the hammer’s checker face design makes it easy for them to drive nails with better accuracy. Its overstrike steel protection plate that protects the handle from any potential damage is also a popular characteristic of this model. 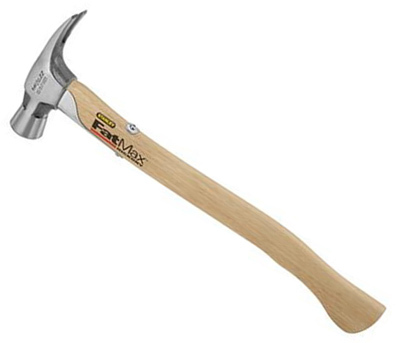 What makes Stanley FatMax framing hammer ideal is that it has a long handle for greater power and leverage. Thanks to the handle, there is no need for anti-Vibration technology. However, it may have problems with its handle since wooden handles typically break down over extended use. This hammer boasts of its balance and temper. What makes this possible is that its head and handle are both forged in a single structure. Estwing is known for its passion for producing only the best hand tools in America for 90 years. Their products are carefully forged and polished in America. You need not worry about handling it because its Shock Reduction Grip is carefully designed to reduce the amount of vibration that comes with the impact. This feature is going to help you much if you are working on a project that requires extreme accuracy. I am happy about the hammer’s ability to handle light to medium jobs. I also find that the hammer is light, but not too light. Comes in three convenient sizes: head weight of 12, 16 and 20 oz. The Estwing Rip Claw Hammer is excellent when it comes to power and durability because of its solid steel structure. However, it may have problems with occasional factory defects concerning its surface or claw. This serrated-faced lightweight titanium hammer comes with a straight hickory handle that offers great durability. It also has a one-of-a-kind overstrike guard in order to protect the handle. The shock absorbing design provides ease in handling. Additionally, its Naloc Magnetic Nail Holder feature allows use on both Standard and Duplex Nails depending on your needs. This hammer also has two extra features that make it easier for you to handle it – a side nail puller that gives you extra leverage and reinforced claws that give it more strength. I’m surely glad because of its nice balance and side puller. The flat claws also make it easy to use the hammer in prying lumber apart. Plus, the pounding won’t tire the elbows. The Dalluge Titanium hammer is ideal when it comes to leverage and strength. However, it may have a problem with its hickory handle since all wooden handles break down relatively sooner than steel ones. The Stiletto Ti-Bone Titanium Hammer is made from all titanium and so this makes it stronger and lighter. This feature also allows it 10 times less recoil compared to those with steel handles. You will also appreciate the lightweight head made up of 15 oz titanium because this can have the same force as a 28 oz steelhead. It also has a magnetic nail start feature conveniently placed on the hammer’s nose. This helps you handle one-handed nail sets easily. Many believe that this hammer is really a good buy because of its strength. With a full swing, you can move a cranky board straight into position. Moreover, even with less force, the hammer creates great impact. This framing hammer is excellent in terms of power, control and leverage because of its lightweight nature and efficiency equal to that of steel. However, it may become problematic with its high price. This 3-pounder is useful if you want to do demolition work involving masonry nails, chisels or stakes. With the Fiskars Club Hammer you can do this single-handedly. What makes this hammer interesting and very useful is its wedged demolition head. As the name suggests, it has as much as 5 times more destructive power compared to traditional designs. You will also like it because the debris does not go directly to your face but are rather swept off towards the sides. You can also strike nails with greater accuracy because of the hammer’s extra-large diameter driving face. This means less effort on your part to be accurate. 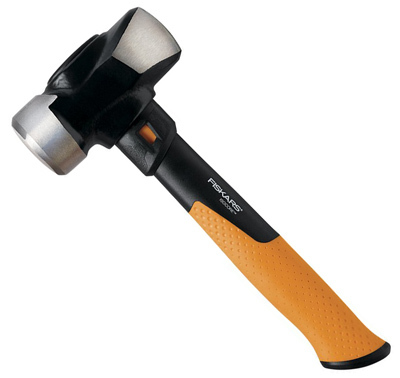 You will also love the flared handle design that makes the hammer fit in your hand perfectly. The energy-conserving dual-layer handle helps improve the efficiency of the entire hammer. This is a very useful feature when trying to demolish almost all types of resistant materials. This framing hammer is excellent with more serious and more difficult framing jobs because of its large size and high level of destructive power. It also has a full lifetime warranty. However, its large size (3 lbs or 48 oz) means it is heavier than usual. This hammer makes it easy for you to swing it with less effort on your part because of its optimal weight. Moreover, it has an oval-shaped strike face that will make it less difficult for you to toe-nail. The hammer’s side nail puller is also helpful in pulling nails efficiently and easily. This allows you to do your hammering fast and conveniently. The one-piece steel construction allows for a balance of gravity with the hammer’s optimal weight. This also allows for precision balance that conveniently reduces the fatigue that you get on your elbows and shoulders when you do hammering work. It gets praises for being balanced in terms of weight and for feeling comfortable on the hand. This hammer also swings with so much ease in my opinion. 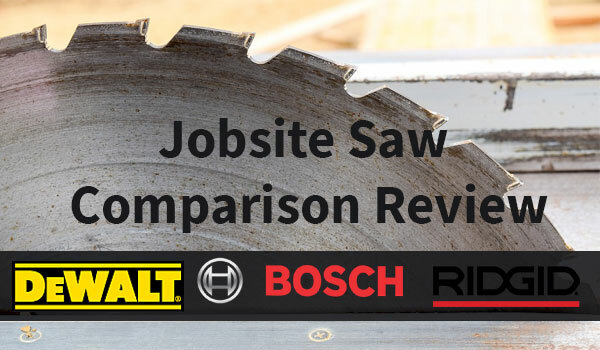 The ergonomic handle of the DeWalt Claw Hammer makes it deserve a higher price than Stanley. This framing hammer is ideal for long-term framing work because of its strong one-piece steel structure. However, it may have problems with vibrations because it does not have an anti-vibration or shock-resistant feature. 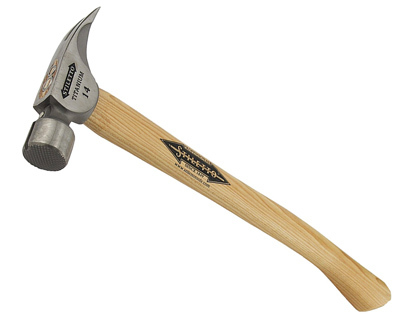 The Stiletto Titanium Framing Hammer is defined by its hickory curved handle. This shape allows greater swing control and reduces recoil shock by 10 times! Another factor that makes this happen is the fact that it is 45% less heavy compared to other framing hammers. Dubbed as the original Titanium framing hammer, this tool is conveniently lightweight. Nonetheless, it has a driving force that is equivalent to 24-ounce steel. This gives you less effort in pounding. The hammer also has a Magnetic nail start feature on its nose. This is once more useful when you have to handle one-handed nail sets. What I like about this amazing hammer is the convenient grip that allows better control and definitely adds leverage. This hammer is great not just for the price but also the capacity of the hammer to improve his framing abilities. This hammer is perfect for greater leverage and control and less fatigue because of its lightweight but efficient titanium head and curved handle. However, the wooden hickory handle may become a problem in the long run as it is vulnerable to chipping. 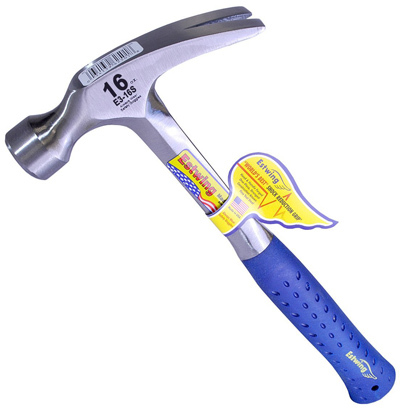 This 16-oz hammer is perfect when you are driving small nails on a sensitive surface that you do not want to damage. This is useful when you are doing small-scale projects that need accuracy. What is good about this framing hammer is its IsoCore Shock Control System that helps reduce the impact of every strike on your body by absorbing the shock and vibration. This efficiently minimizes up to 4 times less shock compared to those with wooden handles. The hero here is the insulation sleeve that neutralizes the shock before it even reaches your hand. You will also find the dual-layer handle more useful than it actually is because of the combination of properly insulated materials that dampen any other vibration that lingers after just one hit. Plus, the manufacturer generously gives you a lifetime warranty for it. I am extremely satisfied that the Fiskars Rip Claw Hammer is excellent when it comes to trim carpentry. The hammer’s great balance of weight, size and efficiency is what makes this product worth your money. 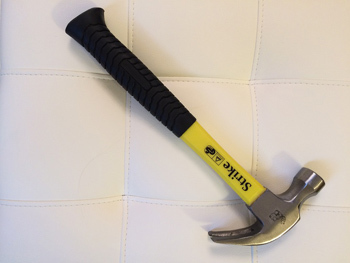 This framing hammer is powerful and durable because of its one-piece steel structure. It also has a shock control system and lifetime warranty. However, it can be a little expensive. 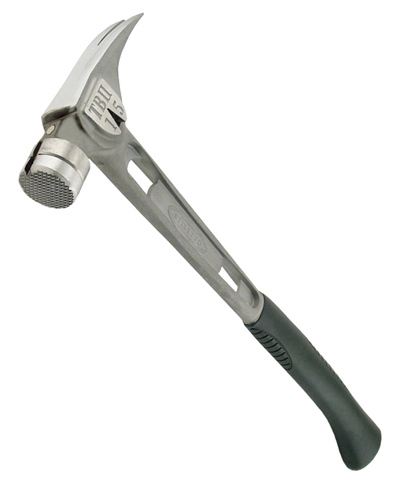 The Stiletto Milled-Face Hammer is another hammer with a 10 times reduction in recoil shock compared to steel hammers. It is also interestingly stronger and lighter because of its 15 oz titanium head. Thus, both of these features help you use the hammer without hurting your elbows and shoulders. Overall, its 100%-titanium handle aims to provide leverage, control and balance. In fact, one user says that despite the price, the handle alone makes the hammer a really good deal. Its magnetic nail start feature on its nose is useful with one-handed nails. What adds to the convenience is the ergonomically shaped handle grip that is made from rubber and allows you greater power and leverage. If there is one thing that will surely make this hammer last for a long time, it should be its replaceable steel faces. This hammer can last upto 15 to 20 years based on my experience. It is a bit expensive but what makes up for the price is the durability, lightness and extreme convenience and efficiency when using it. This framing hammer is almost perfect because of its versatility, power, leverage and shock control. However, it may have problems because it may be too expensive and attractive to thieves. 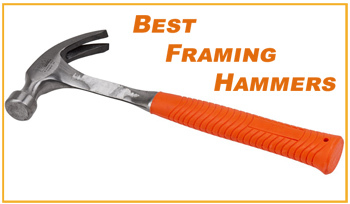 For anyone who is in search of the best framing hammer, then you should know that it largely depends on your working conditions and circumstances. Get familiar with these tips and tricks that you can use to find the best framing hammer that you need. Before you can use a framing hammer, you should first know what sets them apart from other hammers that you usually see. What you usually see in the industry is a standard or a homeowner’s hammer. Framing hammers differ from standard hammers in three ways. Weight. While some standard hammers are heavy, framing hammers are remarkably heavier. Standard hammers weigh around 12 to 14 ounces while framing hammers can weigh from 16 all the way up to 32. The reason for this difference in weight is the need of framing hammers for power. You definitely need extra weight when driving 16D nails. Face. If you have used a standard hammer, then you must have noticed that it had a smooth face. The face of the hammer is the one that you use to hammer and drive nails. 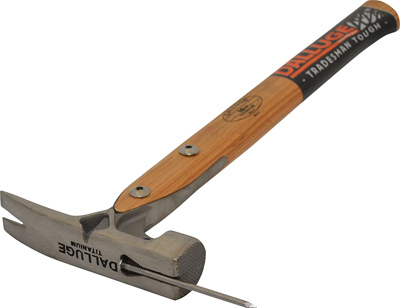 A typical framing hammer usually has an edged or waffled face. This is because the rough serrated surface of that face is used for gripping the nail during drives. That should prevent it from rolling or slipping away from where it’s supposed to go. Length of Handle. You know that standard hammers come with a handle that measures 13 to 14 inches. However, although it depends on the type, a framing hammer is typically anything from 16 to 18 inches. The purpose of the extra length is for added power and leverage with each swing. Powerful. Since, by default, a framing hammer is heavier than your standard hammer, framing hammers are more powerful. While the weight difference may just be two pounds, you should know that such a small difference can already double or compound the force of your strikes. Thus, instead of hitting a nail six times with your standard hammer until it snaps, you only need two taps with a framing hammer. Durability. While your typical standard hammer can snap at any time over extended use, it’s impossible for your solid steel or titanium framing hammer to break down. The worst thing that may happen is the wearing out of the grip over the years. Those with wooden handles may also snap sooner than the metal ones. Leverage. Longer handles for your framing hammers means that it can give you more leverage and power with the same amount of effort as you would a standard hammer. A difference of six inches would also make your framing hammer drive a greater quantity of force on a nail even with mild, average effort on your part. Heavy Duty Performance. Tradesman and craftsmen know the framing hammer for its value especially in building bookshelves, a new playground for the kids, a new basement or similar projects. As long as your framing hammer is powerful, you can do many things by yourself. This feature assigns your framing hammer a high status among DIYers. Efficiency and Safety. The serrated face of a framing hammer prevents nails from slippage when you are driving them. Slipping nails will reduce performance time and may even cause unwanted accidents in some cases. After making it clear what you need the hammer for, the very first consideration that you need to know is the type of handle that you need. The type of handle will determine the type and level of intensity of work you will need for the hammer. If you go for wooden handles, this will be relatively easy for you to use especially if you’re a beginner. The problem is that, over time, the wooden handles may snap because of extended use. This snap may happen anytime you’re working with your framing hammer like when you are trying to pull out a nail. If you go for steel handles, then you will have a very durable handle and it won’t snap. You will also not have to worry about whether you are applying too much or just enough pressure on a nail that you are ripping out. However, the downside to this is that the vibrations might work their way up your wrist, elbow and shoulder because steel is such a poor shock absorber. Fiberglass handles are halfway between wood and steel handles. It is tough yet it can eventually break over extended use. The good thing is that it is a more efficient shock absorber compared to steel. A good and common type of handle is titanium. Titanium, however, is just a lighter version of steel. It allows you less swinging effort and greater control and leverage. Still on the topic of handles, you should also take into consideration the size or length of the handle. It depends on the type of work that you will do because some hammering on the ground will need a longer handle. You also need to consider whether you are comfortable with it or not. Now, if you are wondering whether the right hammer for you is big or short, then you should ask yourself what type of work you will do with it. Some small woodwork or steelwork will not need large framing hammers obviously. However, the more important question is how the hammer feels on your hand. If you feel that it is too light or too heavy especially when you swing it, then that may not be the right framing hammer for you. However, it is not just matter of convenience since small hammers will not do as much work as bigger ones. Take note that the largest hammers will not be worth it because it will cause much shock and user fatigue. You may also get carpal tunnel syndrome from big hammers. Tennis elbow or even something as simple as fatigue swinging are also common. Either way, avoid these gigantic hammers. 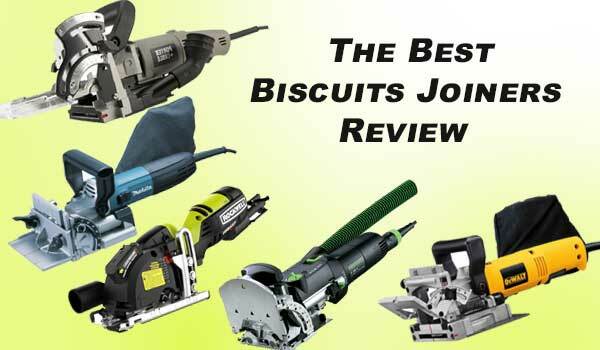 Get a medium-sized wooden hammer or a steel or titanium one with proven shock absorbing feature. Most framing hammers have a special shape for its face by default. A milled face allows easy gripping of nail heads. The choice of many users, however, is the waffle face as it does not only make nail gripping easier. It also prevents annoying slips when you’re driving the nails. Smooth faces are good although the waffle face is more popular. Edged faces do the same thing as milled faces. The only health concern with jobs that require a framing hammer is carpal tunnel syndrome and a general fatigue of the arms and elbows. In that case then go for framing hammers with either a wooden handle like Stiletto Titanium Framing Hammer or the Dalluge Titanium Hammer since both have hickory handles. However, since wooden handles may snap in time, you can go for steel hammers with patented shock absorbing technology. 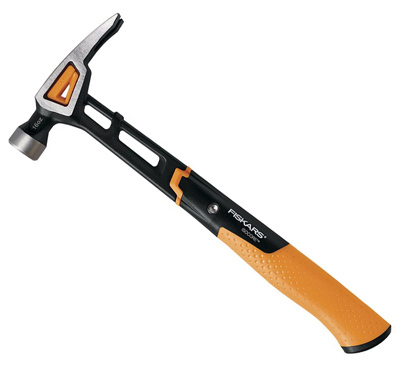 Among those already mentioned, you can go for the Fiskars IsoCore Rip Claw Finishing Hammer for its IsoCore Shock Control System. Another safety concern with framing hammers is whether you are a beginner or not. Although there is no specific framing hammer intended for beginners, you may go for lighter ones with handles that are made from wood such as Stanley FatMax Over-Strike Framing Hammer or the Fiskars IsoCore Rip Claw Finishing Hammer. Large framing hammers may cause accidents when used by beginners. Before buying your desired framing hammer, it is recommended that you check the manufacturer’s guarantee. Long warranty is usually a sign of a manufacturer that is confident in its products. Find out too if the warranty covers the important components like the handle and the head. Go for full lifetime warranty like those by Fiskars. You can opt for the Fiskars IsoCore 3 Pound Club Hammer or the Fiskars IsoCore Rip Claw Finishing Hammer. The manufacturer gives a lifetime warranty for these hammers in exchange for their relatively high prices. The last, but certainly not the least important consideration is the price. Some framing hammers cost as low as $15 to $20 but some are as expensive as $200 and some even more. Just remember that when it comes to framing hammers, price depends on one thing – quality. If you want a hammer that will last for a year or so, then you can opt for a cheaper one. However, if you want something that you can pass on down to the next generation, then you should go for the really more expensive ones. If you’re the type who only pays for the bare minimum, then you can go for Stanley FatMax 22-Ounce Over-Strike Framing Hammer. Although it is made from strong hickory wood and the head and handle have been “forged and heat treated,” there is still the risk of damage to the head after some time. That explains the price. 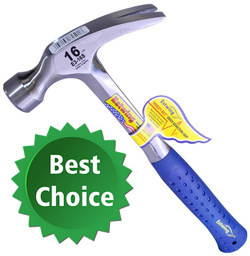 For an average choice of price, you can go for Estwing Rip Claw Solid Steel Hammer. It is extremely durable as Estwing has that reputation since 1923. However, there is a chance that the silver lacquer that covers the hammer may chop off over extended use. Thus, if you want the best offer, at the highest reasonable price of course, then your choice should be Stiletto Ti-Bone Titanium Hammer. Made from titanium, you will realize that it has the strength of steel but the lightness, convenience and leverage of titanium. Always use the right hammer for the job. If you need a framing hammer, then you should do so. However, if that work needs a sledge hammer or a mallet, then don’t use a framing hammer for it. 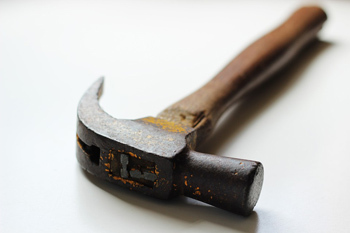 Avoid striking steel surfaces with your framing hammer. This can produce flying metal chips that can potentially injure you or another person nearby. Don’t use a hammer with a broken handle or a loose one. Tighten the handle or head before you use any framing hammer. A head that immediately snaps may cause an unwanted injury. Avoid using a framing hammer with a cracked or chipped head. That chipped head is a time bomb that may hit you in the face at any moment that it snaps. Hold nails properly to drive them easily. Hold the hammer too as if you are just giving someone a handshake. Adjust the power of the hammer by grasping it nearer the head for greater power. For relatively smaller nails, use the framing hammer to tap it lightly until it begins to sink into the wood. Make sure that you have protected the wood from breaking before you drive the nail in place. Swing the framing hammer from your elbow if you want to drive the nail fast. However, swing your hammer from the wrist if you want to assume greater control. Don’t use too much force when driving nails since you can damage the wood or bend the nails with the strength of your framing hammer. In simple terms, a good framing hammer is one that can offer you great control and leverage when doing your carpentry and building work. Nonetheless, its size, weight and length of handle will depend on the specifications of your project. What you should watch out for is always the anti-shock or anti-vibration feature that goes along with the durability of the hammer. Go for fiberglass or titanium handles for obvious benefits. 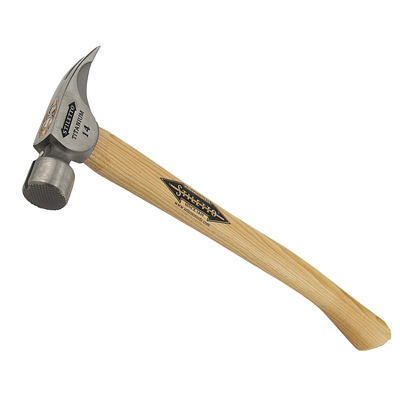 Among the list of our framing hammer product reviews, the best choice is Estwing Rip Claw Solid Steel Hammer. First of all, because it is solid steel, then it won’t break. Moreover, in order to reduce its vibrations, it is built with a Blue Shock Reduction Grip. 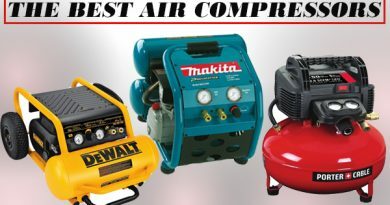 Its balance and temper also come alive with its versatility in handling light to medium jobs. Aside from that, it is made from the finest American steel from its maker since 1923. 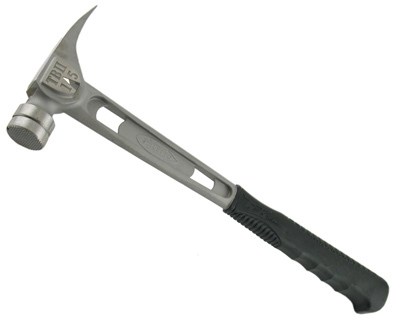 The hammer also comes in three available sizes of 12, 16 and 20 ounces. Most of all, it is not that pricey.